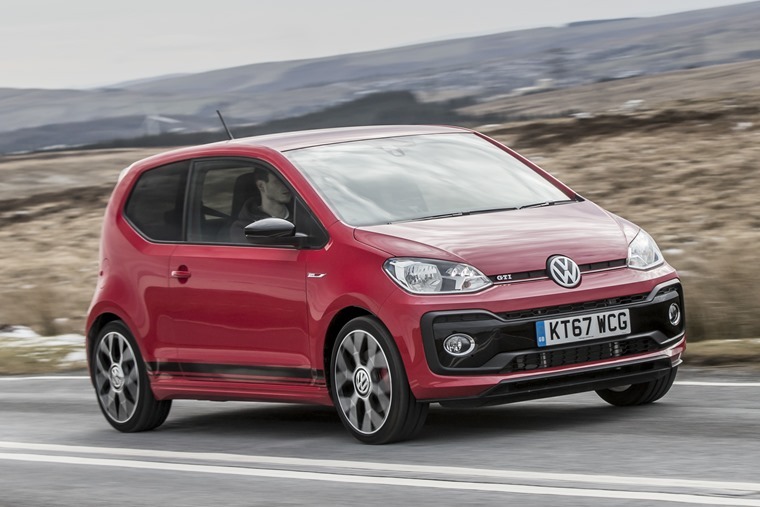 It seems you can’t escape talking about the new Volkswagen Up GTI without comparisons being made with the Volkswagen Golf GTI Mk1. 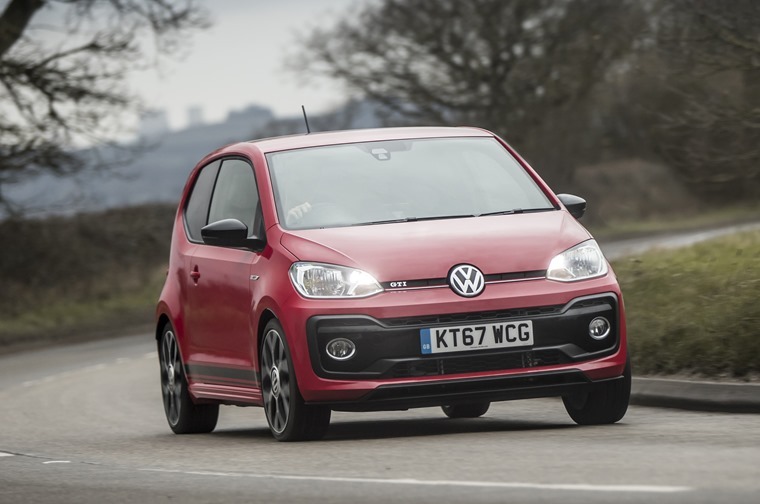 Partly that’s VW’s fault due to initially pitching the Up as an homage to its original hot hatch. But forget about the past, it’s not a Volkswagen Golf GTI Mk1. What it is, is the the most fun you can have driving a one-litre car. Here’s five reasons why. Whereas the Golf may be the premier vehicle in the GTI range, the spirit of what those three letters stand for is exemplified by the Up GTI, distilling the GTI spirit into a potent concentrate. Throwing it around county lanes, A-roads and around little villages, it was a car that was impossible not to constantly push. Think Jason Bourne abusing an Austin Mini Cooper through the streets of Paris and that gives some indication of how you can’t help but drive the Up GTI. It asks for it. Turn into a bend on a decently fast section of road and the VW’s nose goes where you point it faithfully and remains alert to any change in steering input. Push too hard and the front tyres begin to run wide in typical front-drive fashion. There’s no drama to this, just a cautionary note to the driver to ease off. This is a fun and lively car that lets you play when the opportunity arises but is also suitable for just nipping to the shops, or to work and back, if you can restrain yourself. No distractions! No endless array of knobs, buttons, unresponsive and obtrusive touchscreens and speed limiters, just you and the steering wheel and gear stick and a DAB radio. Bliss. There is a Maps and More Dock and app so you can access your smartphone in the blink of an eye if you can’t handle all that though. 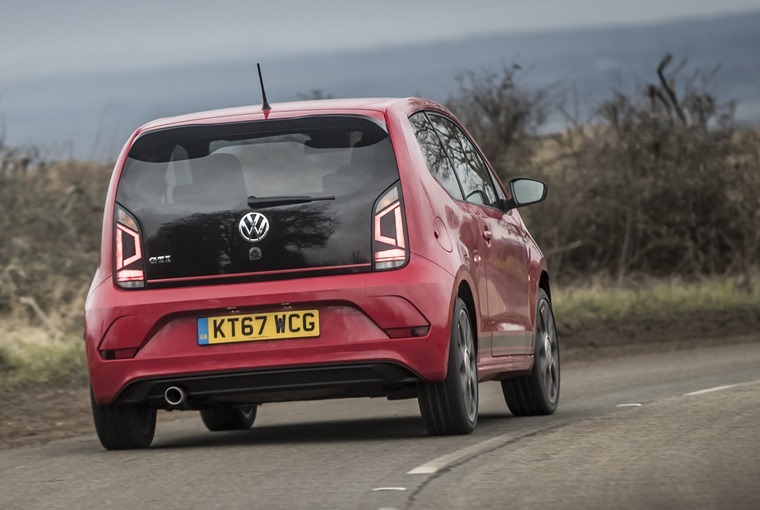 Yep, the Up GTI is a car where the emphasis is on engaging and interacting with it rather than just cruising along aimlessly in the knowledge the automatic gearbox will swap cogs and the handling will see you round the next bend safely thanks to a suite of technology. 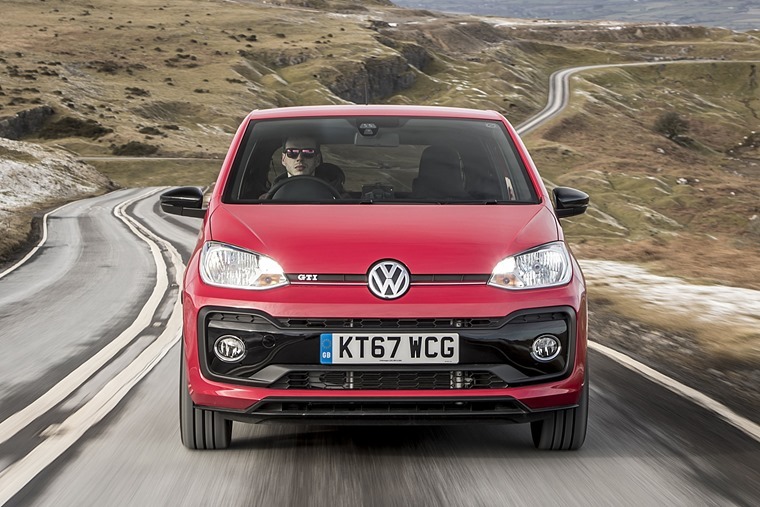 There is ESP and other safety kit included with the Up GTI, of course, but its moderately wide 195/40 tyres on 17in Oswald alloy wheels mean the grip is in balance with the power of the engine and ability of the chassis. With a turbocharged 1.0-litre, three-cylinder engine producing 115hp at 5000rpm, it makes a zingy noise as revs build which filters into the cabin to give that sporty sensation. This has the knock on effect of getting you to push harder and faster than you otherwise would. At lower revs, the pick up is generally quick and smooth and as such it far prefers lower gears and high revs. This all adds to the experience in my opinion, even if it means the stated 58.9mpg is unlikely to be achieved. Purely comparing numbers, you can kind of see where VW are coming from. At 3,600mm long and 1,641mm wide, it’s only 105mm shorter and 13mm wider than the original, while it gains 5bhp at 115bhp and is marginally faster than the first ever GTI. It does gain a little weight over the 1975 hot hatch, coming in at 1,070kg, but this is offset by the fact its 1.0-litre three cylinder engine is turbocharged. It therefore boasts 142lb ft of torque from 2,000rpm whereas the Golf managed just 103lb ft at 5,000rpm all those decades ago. While the numbers add up, in comparison to today’s hot hatches is where it all fall apart. Alas, that all feels somewhat irrelevant because it’s not trying to be one of those. It’s a nice, warm, affordable Up GTI. “The people’s supercar,” is the tagline VW is using and it’s hard to argue. It’s not an intimidating car to get into and drive. It’s accessible, unassuming, fun and rewarding to drive on all roads. With all the perks of an Up – from size, build quality, and manoeuvrability – and enough additional character to add a little sizzle, it’s a car I can’t stop thinking about.